Let’s celebrate our blog birthday! Eight years ago today we wrote our very first blog post here on our Elmastudio blog. We also started using WordPress for our website and at that time and decided to create a lively WordPress blog from this day on. This decision changed a lot, since we only had a small portfolio website for our freelancing business before. We worked on creating more content for our blog and step by step we were able to transform our website into a blog platform with an active community. From that point we could publish our first two free WordPress themes and with the support of our blog readers they got quite a lot of attention at the time. From this experience we were motivated to create our first Premium WordPress theme a little bit later on. Now, thirty themes and a few years later, we are still doing the same work and we have even more fun working on our theme designs and on our little Elmastudio business. To celebrate our anniversary we are offering a 30% discount for all our single themes, our Theme Bundle and Ellens video course for WordPress blogger (the course is only available in German language at the moment). 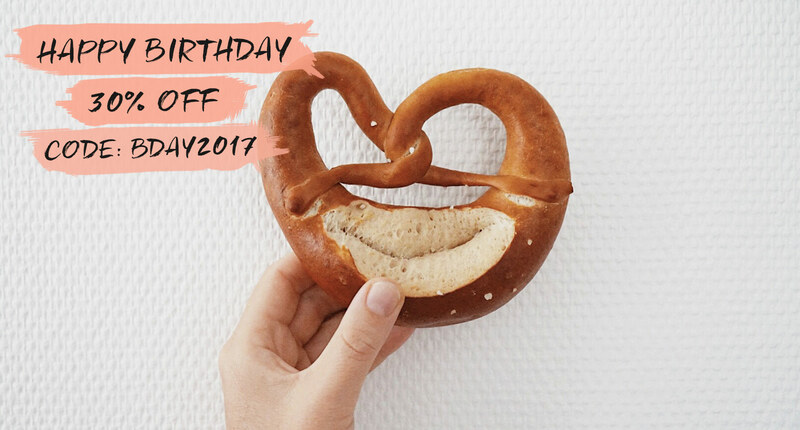 To receive the discount you just need to use the coupon code bday2017 in the shopping cart and the 30% reduced price will be visible on the cart page before you complete your order. Our discount will be valid from now on until July 18th, 23.59pm (CET). You can also use the discount code in combination with your Theme Bundle discount (for everyone, who wants to renew their Theme Bundle now). Of course a birthday like this is also a good opportunity to reflect and look ahead into the future. I’m sure most of you recognized that we stopped releasing multiple smaller WordPress themes over the last months. Instead we started to focus more on expanding our latest and biggest WordPress Magazine and WooCommerce theme Uku. We are also working on the release of our next bigger Business WordPress theme at the moment. It’s still a little bit of work ahead, but we are proud to further move into a kind of new Elmastudio “theme era” with this upcoming WordPress theme release. The WordPress world is changing a lot at the moment (e.g. with the upcoming release of a the new Gutenberg editor), WordPress alternatives are gaining more popularity and the WordPress theme world is in a “growing up phase” as well it seems. With Elmastudio we want to take these new opportunities and create even better themes with an elegant, high-quality design and modern, super flexible user options. We will talk more about these topics soon and release further blog posts sharing our thoughts, so we hope you are as excited about the future as we are. We are looking forward to a new exciting Elmastudio year! Looking forward to celebrating Elmastudio’s Ninth birthday on the 11 th July 2018. Here’s hoping you will be offering your discount again this year.